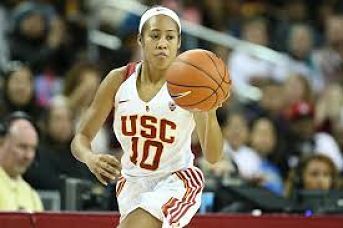 Courtney Jaco helped lead USC in their upset of #20 Colorado with 14 points. Photo by LA Sentinel. 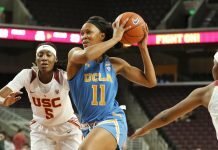 Los Angeles – Southern California opened Pac 12 play Friday night with a resounding upset of No. 20 Colorado, 79-54. Sadie Edwards led the Trojans with 16 points, while Courtney Jaco added 14 and Minyon Moore and Aliyah Mazyck added 12 and 11, respectively. USC got out to fast start and never let up. 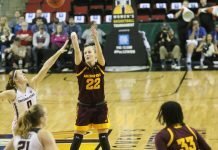 They shot 47 percent and limited the Buffs to 30 percent shooting; they outscored the visitors in the paint, 52-34; and outscored them on fast break points, 26-12. Kennedy Leonard was the lone Colorado player in double figures, with 19 points. 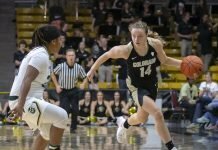 It was the second consecutive loss for the Buffs, who were upset by Wyoming before the holiday break.